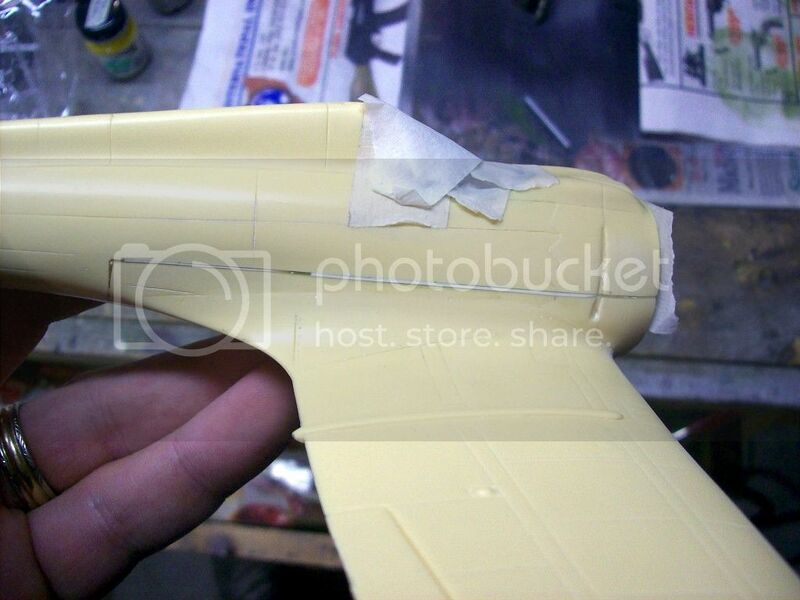 With my P-36 build just needing a couple of finishing touches and my Hs 129 in the holding pattern (both of which I'm waiting on some materials for), I figured I should get started on something new. I haven't been involved with a group build since the BoB GB, so I thought this would be a good opportunity. 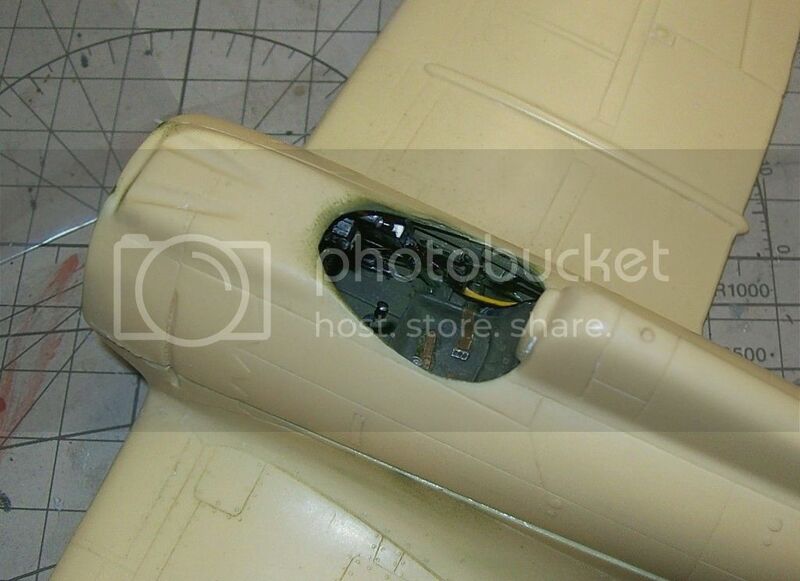 I currently have several of Dave Thompson's designs/products in my stash, including his A6M3 conversion, I-16 engine front/cowl and three different A5M Claude kits. 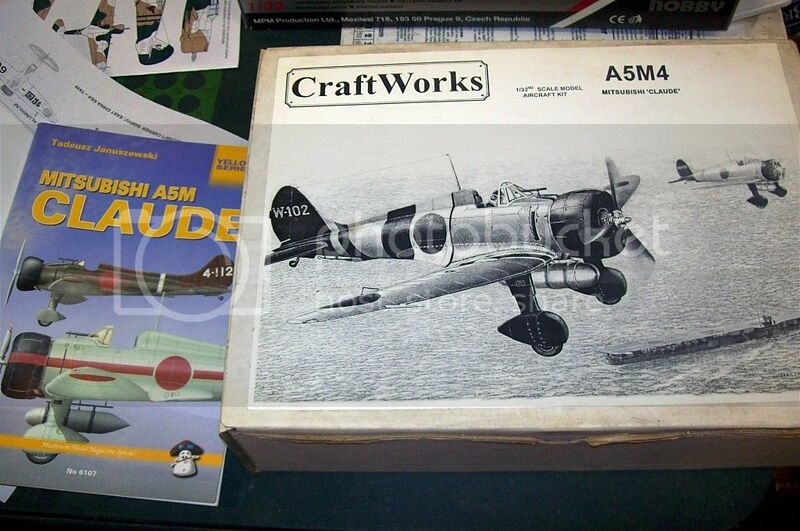 For those who don't know, Dave originally made the the A5M kit under his "Planes With Pants" name, then Craftworks used his masters for their own A5M4 kit, which will be the kit I use for this build. Dave didn't stop there, however. Being passionate about the "Claude", he also made a very small handful of prototype kits (a dozen, or less, if memory serves me) for both the A5M4-K two seat trainer and the A5M2b (early with sliding/enclosed canopy). I was fortunate enough to obtain an example of each. He had put the -K trainer kit up for auction on Ebay and I won it, for a price that wasn't exactly cheap. Being true to his kind-hearted and generous nature, he included the complete 2b kit for me, as an added bonus! That's just the kind of guy Dave was. In some instances, he was probably more generous than he should have been. But, to him, the hobby came first and I know he would delight in seeing things built, rather than sitting on the shelf of some "kit collector". With that being said, I certainly plan to build all of his kits for my own collection of builds. For starters, here's the Craftworks A5M4. This one's for you, Dave! The instructions start with the engine, which is one of the Williams Bros. kits that was included with all Dave's Claudes. I got the cylinders installed and painted, already. However, the crankcase front and pushrods need some work. 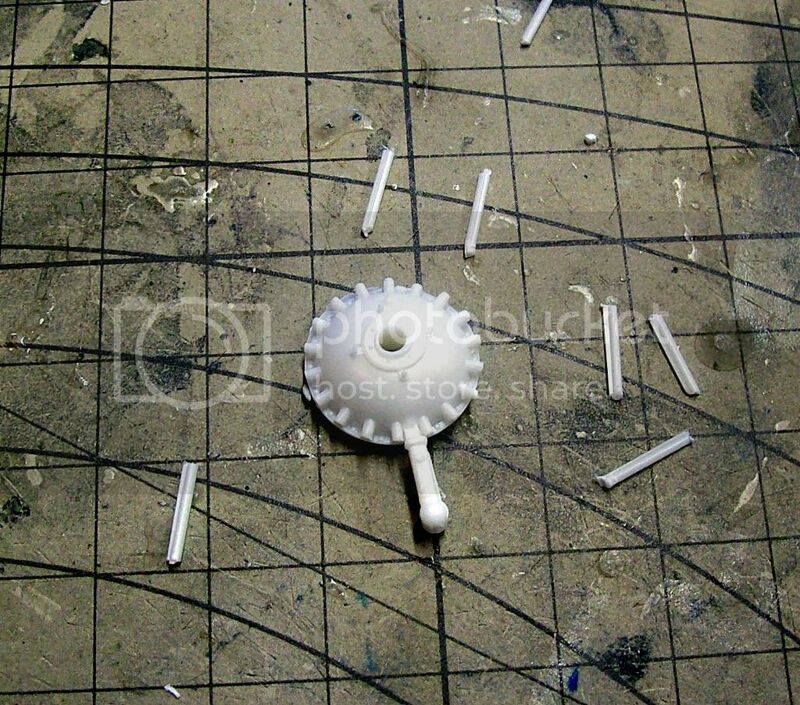 The pushrods were molded off center and the plastic is extremely brittle. So, rather than mess with trying to sand them to something resembling round, decided to cut them off and I'll replace them with metal rod or stretched sprue. The design of this kit is actually kind of nice, in the fact that the wings are a single, solid piece, as is the fuselage. This takes a lot of the alignment and seam work out of the equation. However, for the one big seam that is present, some real work will be involved. I have yet to choose a color/marking scheme, as the outcome of this seam will be a determining factor. If I can get everything perfect, I may opt for a NMF scheme. However, if I feel that the seam isn't smooth enough to pull that off, I'll go for a green/gray option. 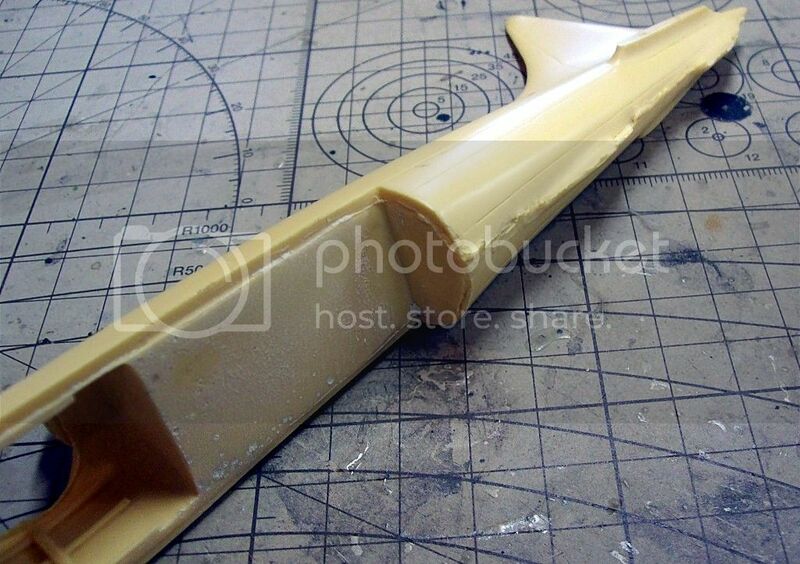 Other than that, there is some cleanup to do on the wing leading edges and bottom of the fuselage. 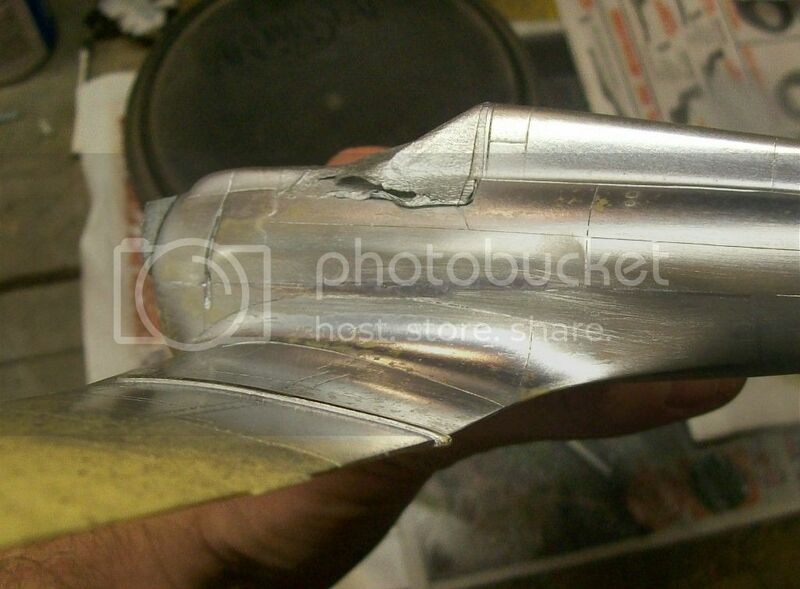 Here you can see the mold seam and the tail hook fairing is in there, somewhere. I've actually run some sandpaper on that, already and it cleans up fast and easy. So, I don't forsee any major problems in that department. 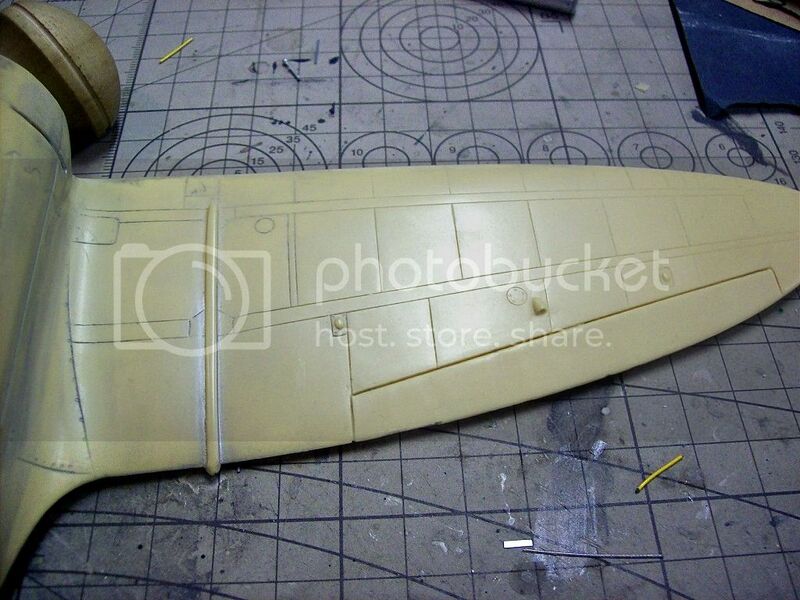 I'm just hoping that the main fuselage to wing join comes out smoothly. I'll post more as I progress. Well, wadda ya know? 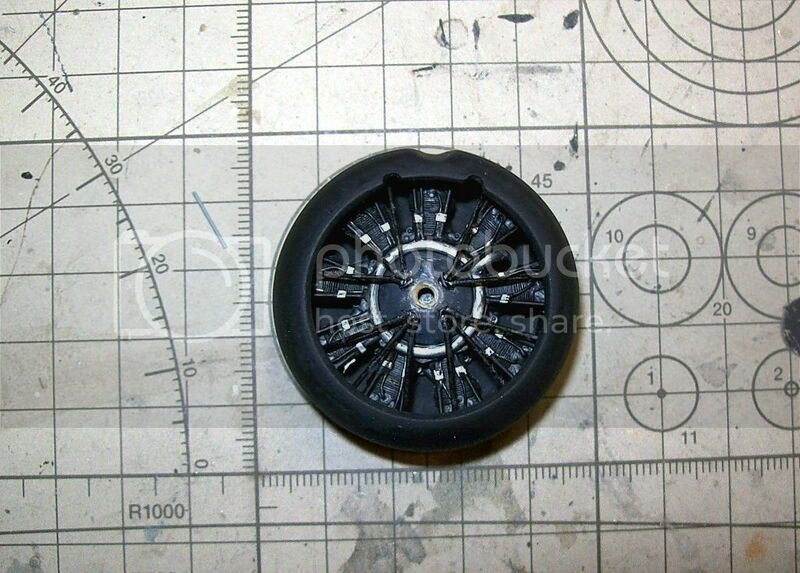 Sometimes it actually pays to look through all the parts in the box and READ the instructions before you start! This looks better, but still won't get me out of fabricating the pushrods. Wow, this one's come out of the blue John! Looks like a great project, and as Iain said, a great tribute to Dave. We certainly need some more activity in this GB. I have to admit that this was "out of the blue" for me, too. I stood in front of my stash this morning, knowing that I had to start something else. I'm probably like many of you, in that I can find all kinds of reasons to not build a kit and that ultimately leads me to building nothing, at all. It's better if I just jump in with both feet, as they say and this being one of Dave's and a kit that will help me participate in a wonderfully conceived GB, just give me all the more reason to do it. Today I got the engine pretty much done. 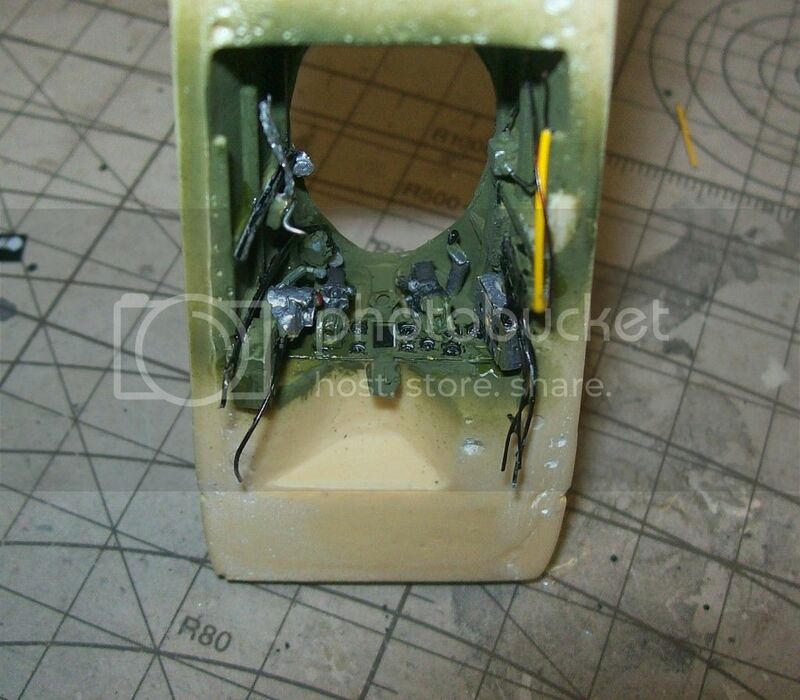 I made the pushrods from stretched sprue and added the ignition wires. Then, I cut small strips of aluminum foil for the clips that hold the wires to the pushrods. 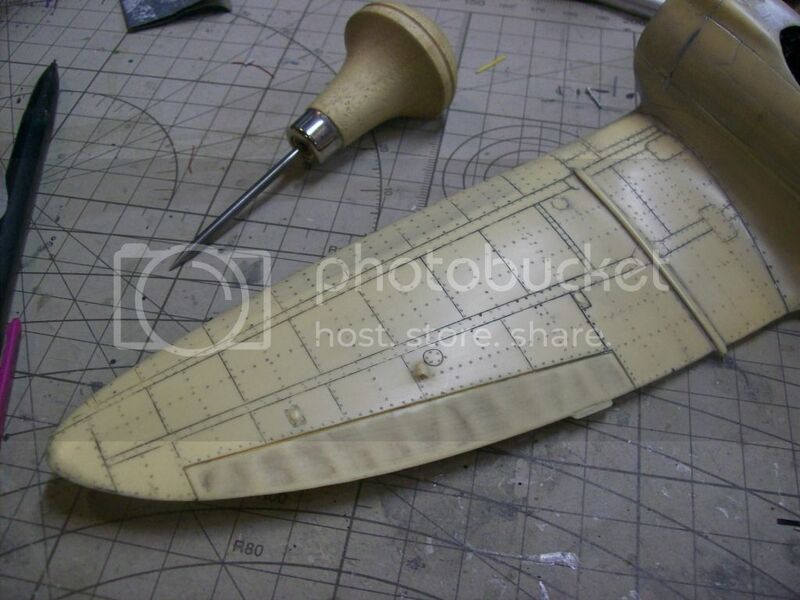 Now, I just have to figure out exactly how I'm going to do the bracing that's at the front of the engine/cowl. Today I did the braces on the engine front/cowl. Then, I assembled the cowl halves with the engine inside, worked the seam (cowl halves are front and back with the seam running in the middle). 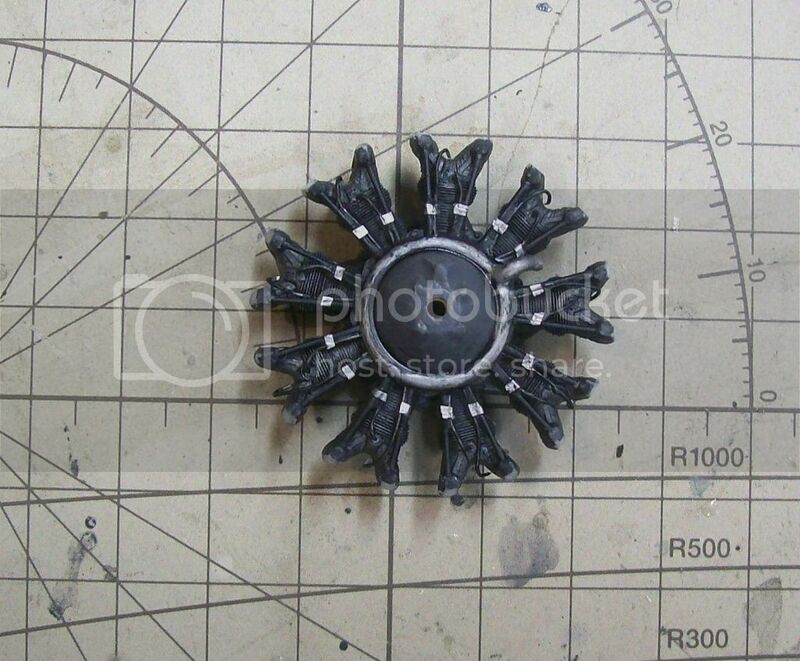 I also polished the prop blades and glued them into the hub. Starting on the cockpit, now. That looks great John! You're really powering along with this one. 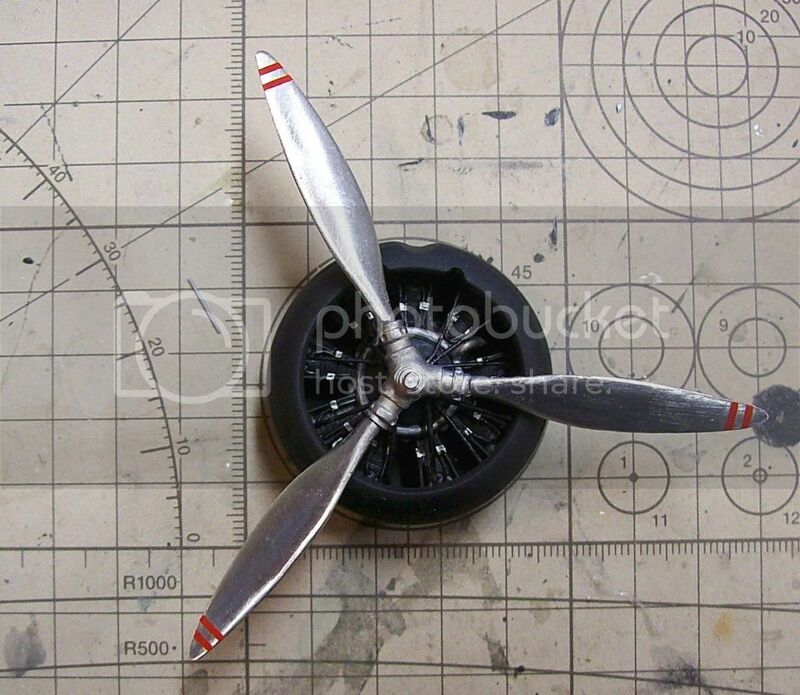 Are the prop blades painted plastic or metal? 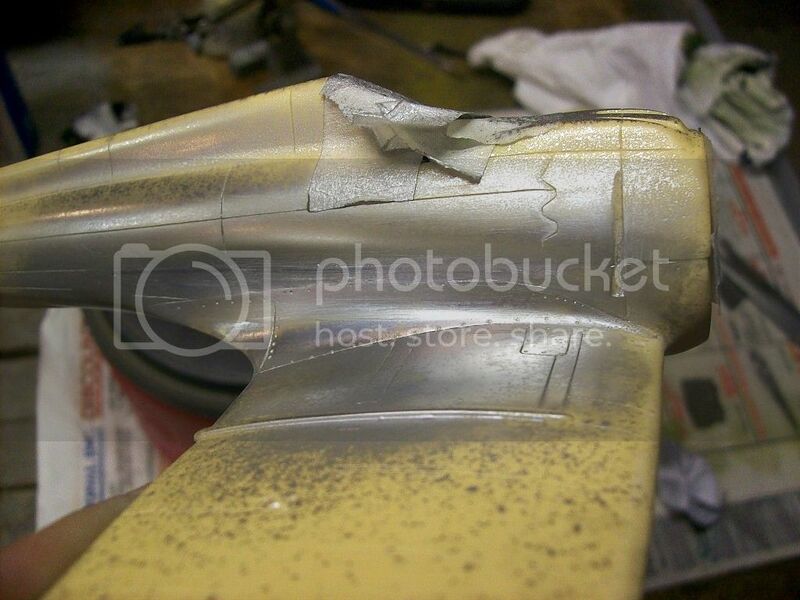 The prop blades and hub are all white metal and I polished the blades. The red stripes are decals and I'll probably dip the blades in future to seal them. Taking a break for today. 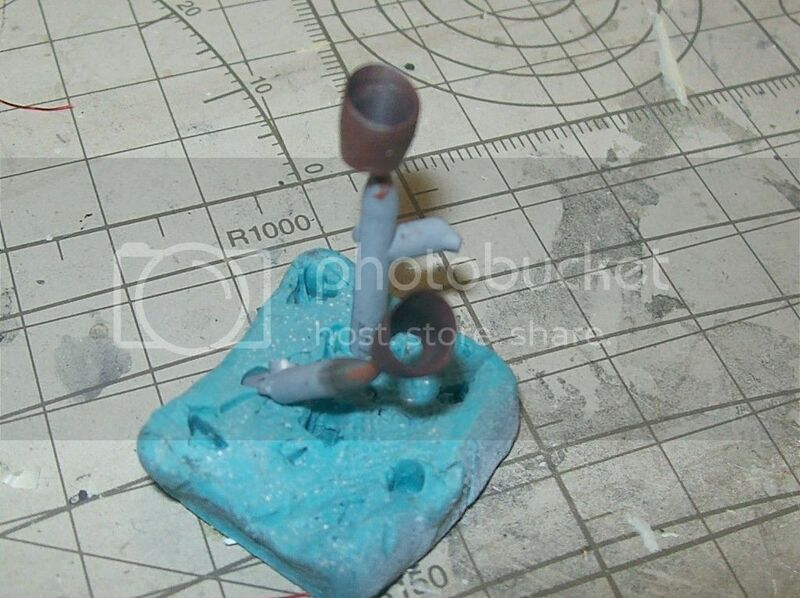 I also worked on the exhaust pipes. Here's what comes in the kit, shown on the left. 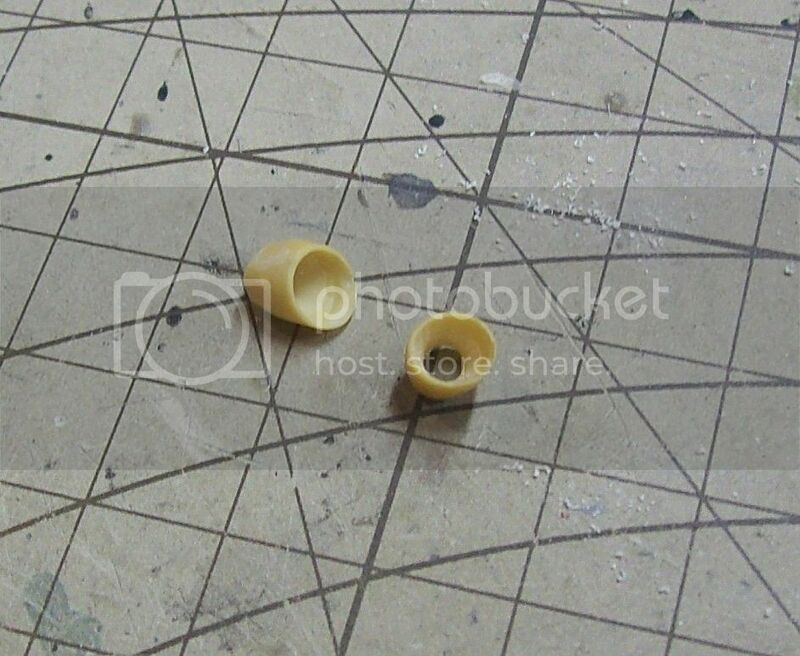 On the right is after doing some drilling and work with a circular file. 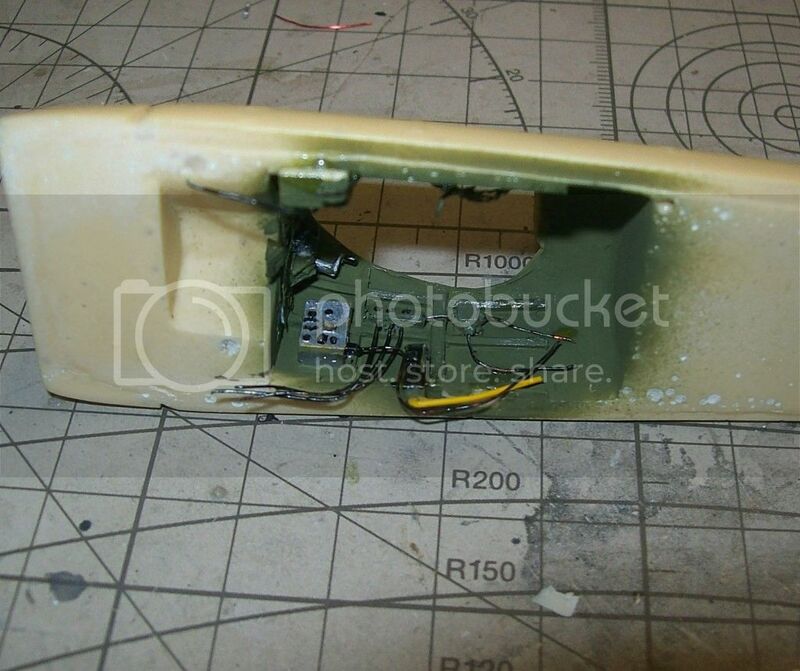 I discovered that the vertical stabilizer had a pretty bad lean to port. After about five minutes of working it under hot water, it straightened up pretty well. 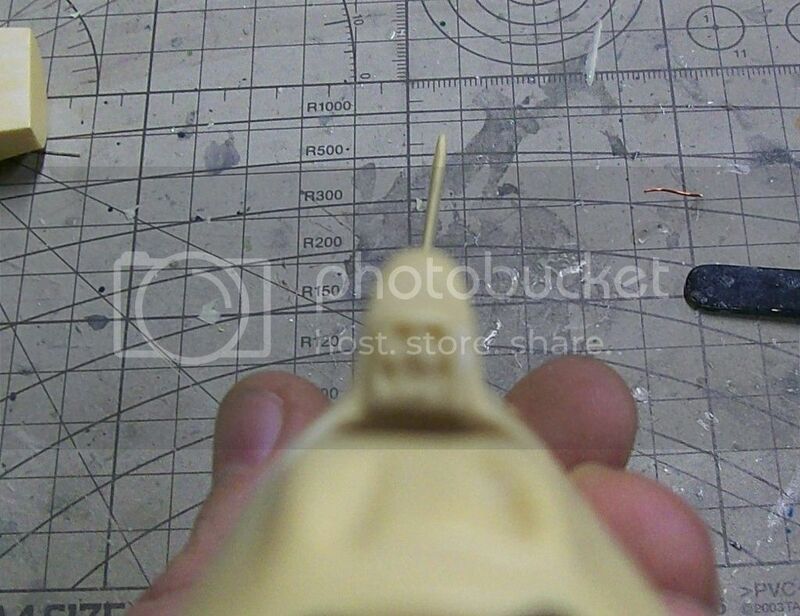 When I glue the rudder on, it should align itself even more. 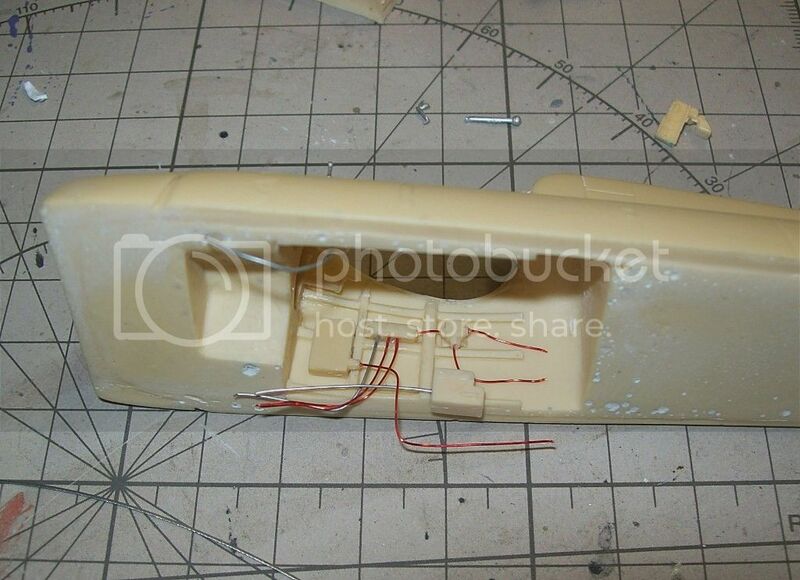 When I started working on the cockpit, I couldn't help but to be impressed with the amount of small parts and their detail. Keep in mind that this kit was mastered as a "Garage Kit" in pretty much every sense of the word. But Dave did an amazing job on it. I couldn't believe the level of detail on some of the smallest parts. 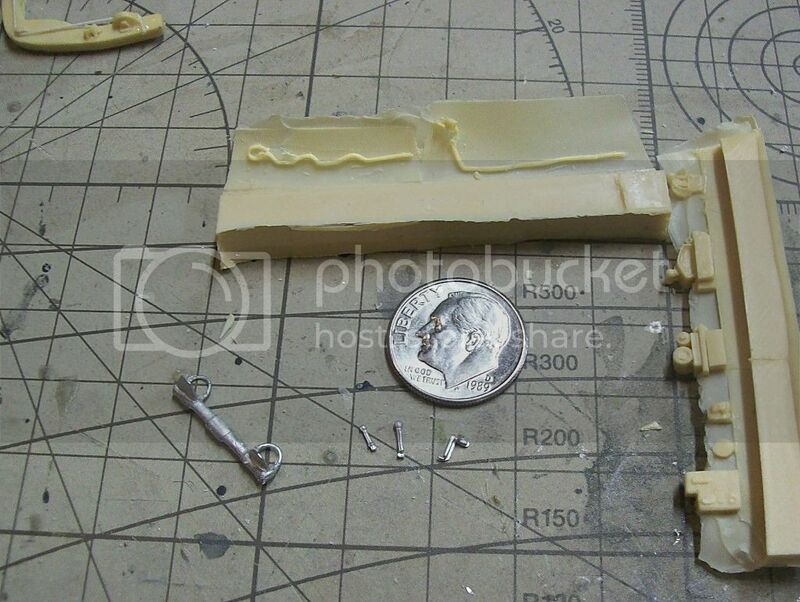 Also, there are some white metal parts that are probably some of the smallest I've seen in that medium. The kit also has a healthy supply of various wire, and even an elastic string for the seat cable. I've got most of the parts in place and am ready to paint the main interior color. 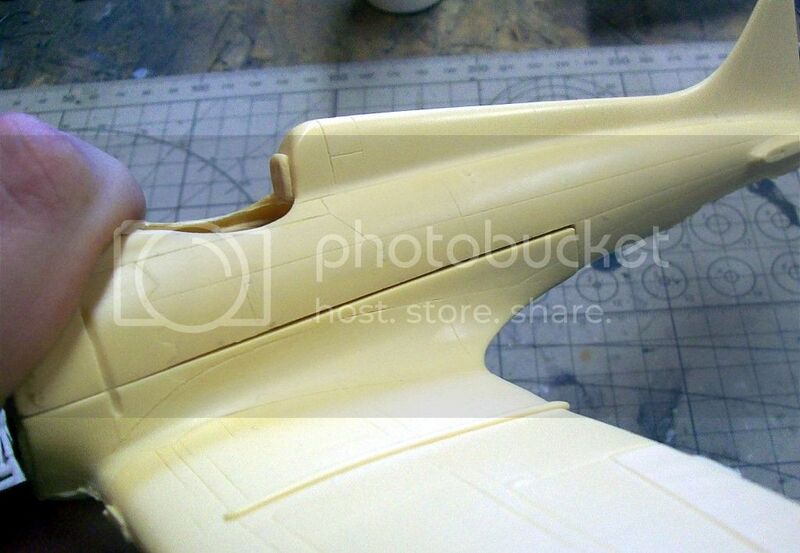 After that, I'll go back in and paint the details in other colors and install the PE/film parts where they need to be. It's pretty close to getting "zipped up", already. A fine tribute to Dave Thompson..looking classy. I particularly like the work on the engine as I adore things like that..
Yours looks very impressive with the propellor blades... ..splendid stuff! Thanks for your support, MARU! 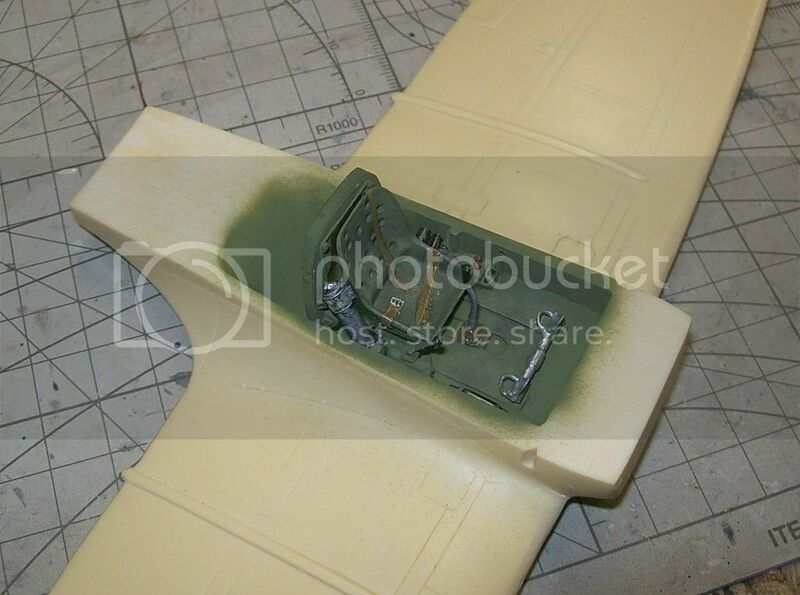 I got the cockpit finished and the fuselage glued to the wing, today. Working in the pit was difficult, given the design of the kit and having to do most everything from underneath, as opposed to the side. 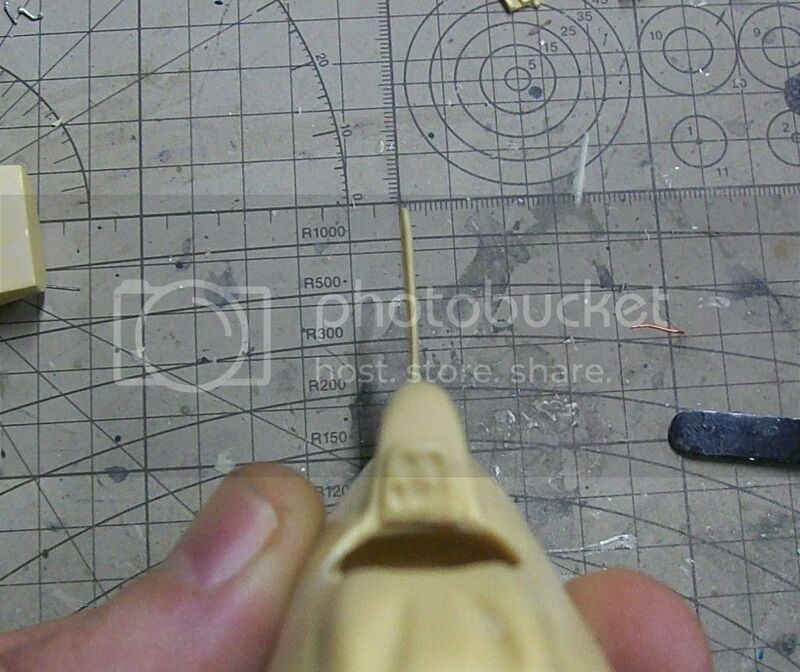 The PE parts in this kit are the thinnest I have ever seen. They're so thin, in fact, that they will bend if you blow on them and that's no exaggeration! I got the IP aligned with the instrument films and installed, no problem. However, the brackets that hold the machine gun receivers actually attach to the IP. The right gun/bracket was shifted a bit and the glue had set. Rather than tear apart the entire affair and risk destroying the IP (which was highly likely, given how thin it is), I decided to leave it. A similar problem occurred with the PE chain on the crank handle. It was so thin as to be nearly impossible to get right. I got it in, but I don't like the way it looks. Otherwise, the cockpit looks really good and it's more than just "busy". 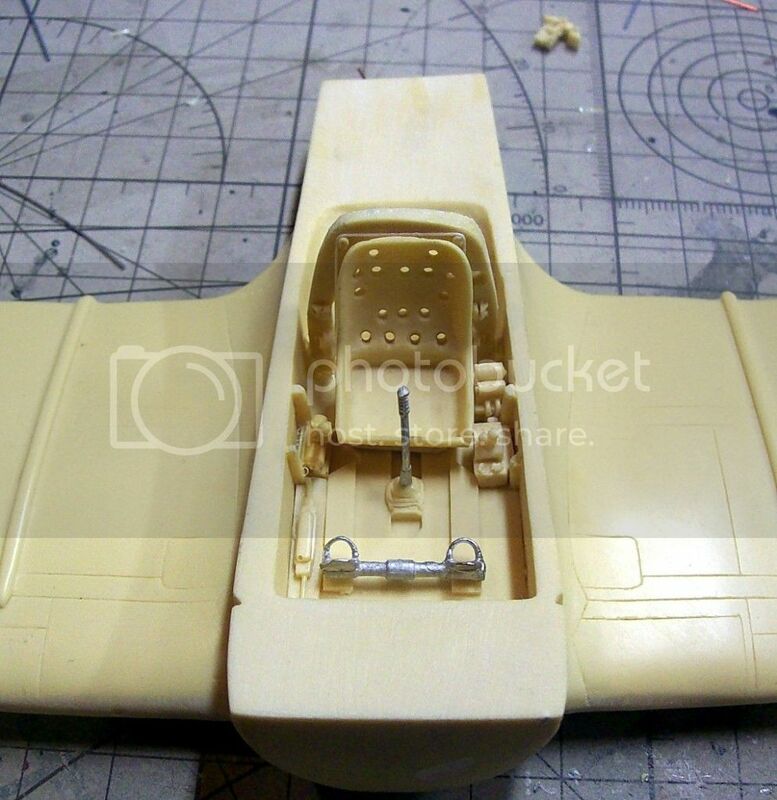 It's downright tight with all the components installed and I had to be very careful when I put the fuselage on the wing, almost like aligning a puzzle, of sorts, to keep from breaking anything. 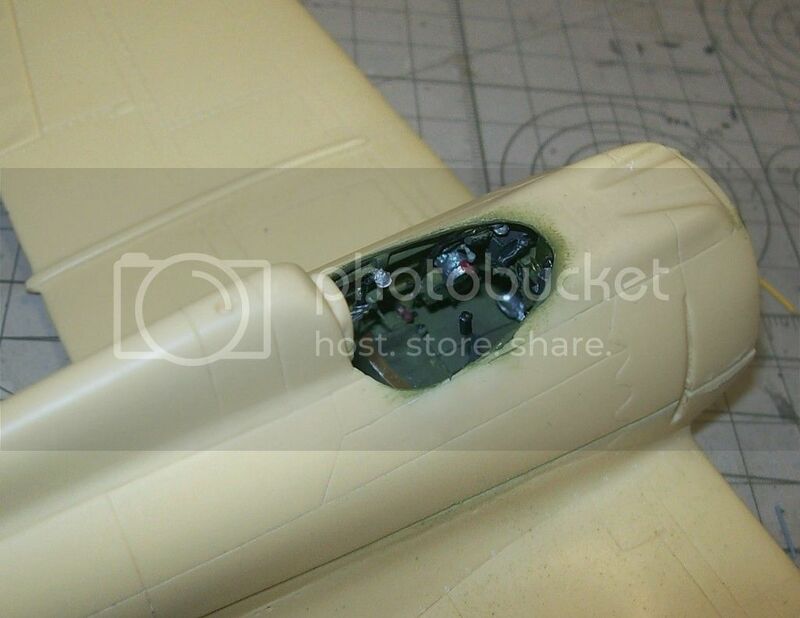 As anticipated, there is a huge gap between the fuselage and the wing parts. I got everything aligned as best I could and poured some CA into the seam, just to keep it together. Tonight, I'll be working on putting some plastic strips in the gaps and filling some more. Also, I was playing around last night with restoring/adding some rivet detail with my jeweler's punch. Well, one thing lead to another and I did all the main panel lines on the left wing. 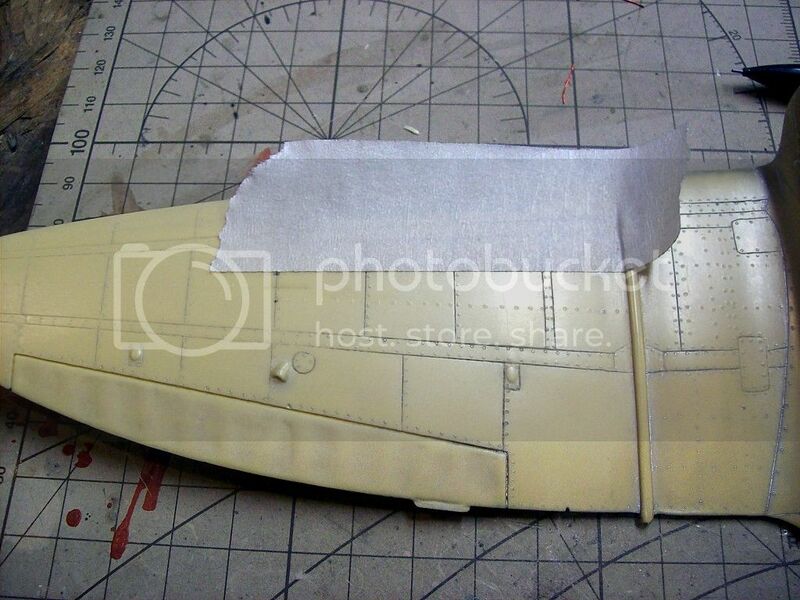 So, it looks like this plane will be getting a complete rivet job, once I get the seams taken care of. I got the gaps filled and sanded smooth. I gave it a test shot with Aluminum Plate Metalizer to see how it looked. Unfortunately, this was my last couple squirts of this paint. I thought I had another can, but I don't. In any case, I don't think I'm going to be doing the NMF finish on this one, as the seam will probably always be visible in that scheme and it would bother me. So, I've already picked out another IJN Green/Gray scheme that I have the right decals for. But, before I can get to that, I need to finish the rivets and panel lines. Hopefully, I can be painting in a day or two (okay, maybe three. lol). 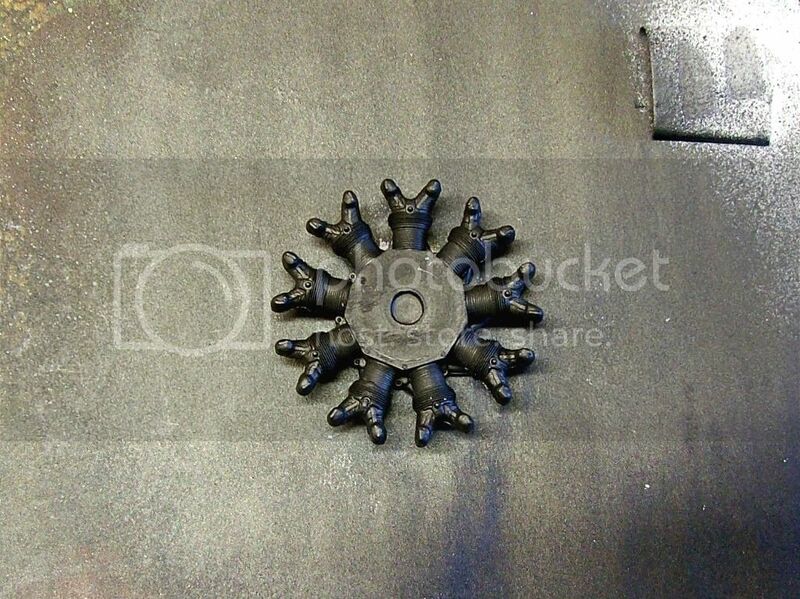 People have asked me how I do my rivet work without a "Rosie the Riveter" or some other wheel-type tool. 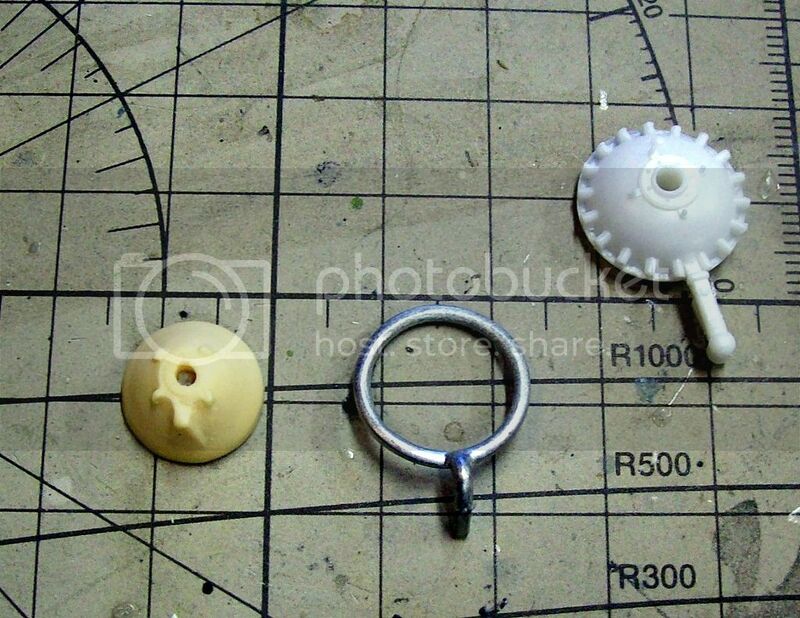 I've always preferred the jeweler's punch, since it makes nice looking flush rivets and not square or round "holes". The catch, is that you have to do them one at a time. However, I've developed a system of sorts that seems to work well. It takes a bit to get the hang of it, so practice on some spare parts, first. 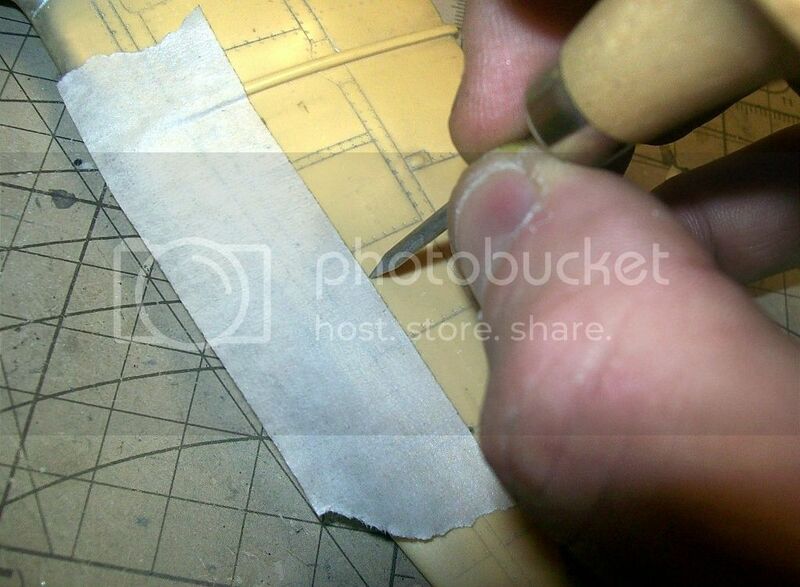 Then, start making your rivets along the tape line. 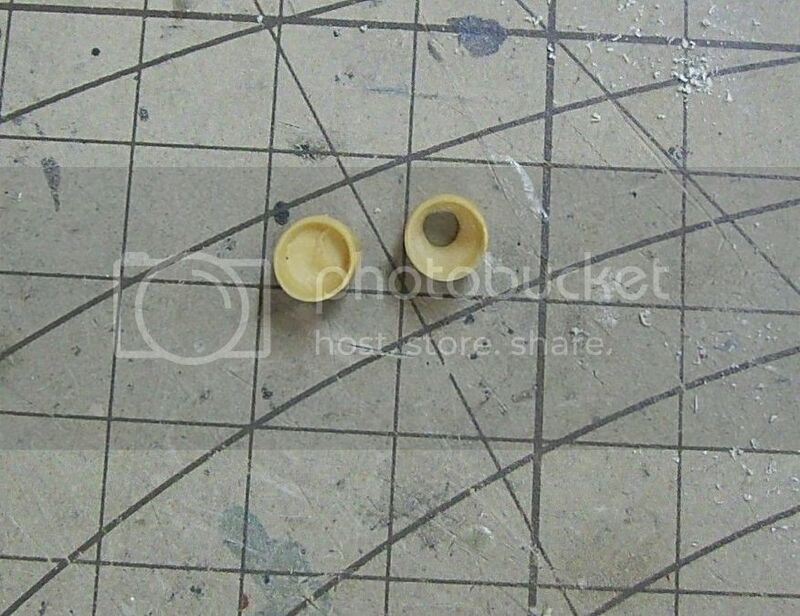 To be perfectly accurate, you would want to figure out the spacing between rivets and use some sort of spacer guide, such as a strip of PE or plastic cut to the appropriate width. However, I've found that I can keep the spacing fairly consistent, free-hand. 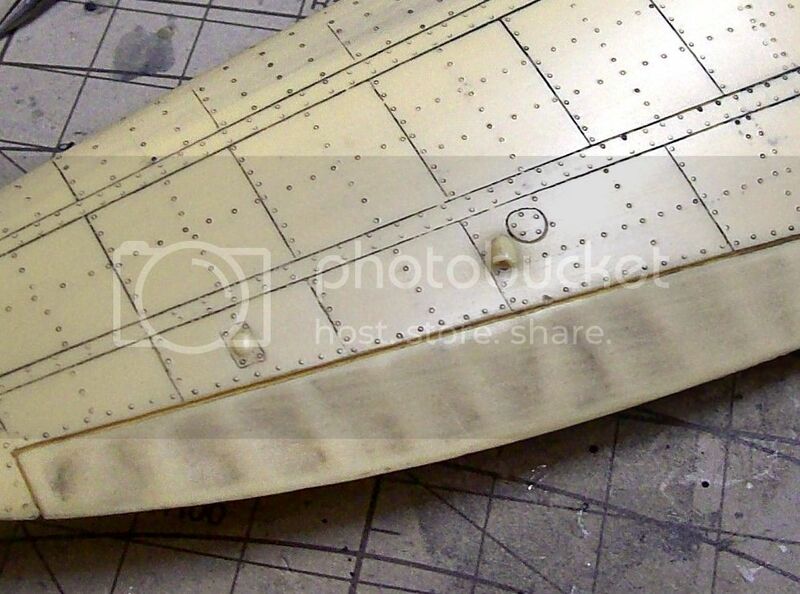 In this case, my rivets are approximately 3mm apart. Once I get going, it goes pretty fast. just be sure to put the tip of the punch against the edge of the tape for every rivet, to keep the line as straight as possible. I usually start by doing either all the horizontal, or vertical lines, first. Whichever I feel is easiest to index from existing panel lines, etc. After a while, you'll find that your previously punched lines start to serve as reference points and you'll be doing less measuring and marking and it starts to go faster. And here's the left wing, which I've just completed. I gave it a wash with black watercolor to show the rivets better. A close up to show the "flush rivet" effect of the jeweler's punch. Now, just a few more to go! Nice progress John. And thanks for a terrific tutorial on the rivetting. I was (ahem) rivetted.